1. Heat(medium high) the oil in a deep frying pan. 3.Stop putting the banana slices once they are just below the oil level. 4.Do not stir, wait for a few minutes(5-6) for the slices to get cooked. 5.Now you can stir them slowly, just by flipping from one side to the other. 7.When it is done add the salt solution (1tbsp for 2 bananas) which has a pinch of turmeric into the oil slowly. 8.Wait till all the bubbles stop coming. 9.Immediately take out the chips from oil using a ladle with strainer. 10.Remove excess oil by spreading on paper napkins.Store in an airtight container for upto a month. I get this special type of raw bananas from the Chinese supermarkets.The bananas you get from most of the Indian grocery stores for making curries is different. If you cut them too thin ,keep an eye on the temperature of the oil. 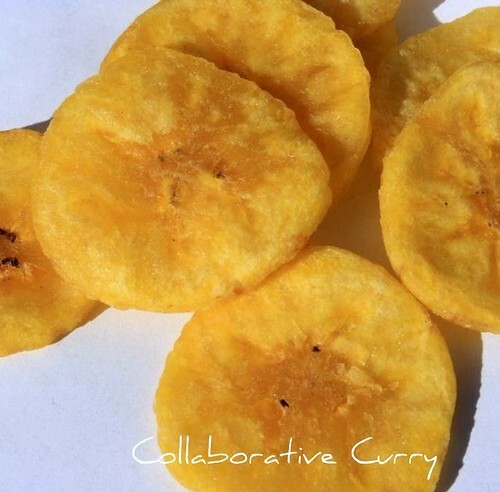 Beautiful pictures gulmohar, love these banana chips anytime of the day.. I think I had tried this before but its dip with some caramel. Wow!!! !lovely click.....really miss all this .....hope I can relish it soon. Superb clips...Like Jacob's ma said even I left it to experienced hands.Now even I'd like to try making them at home. 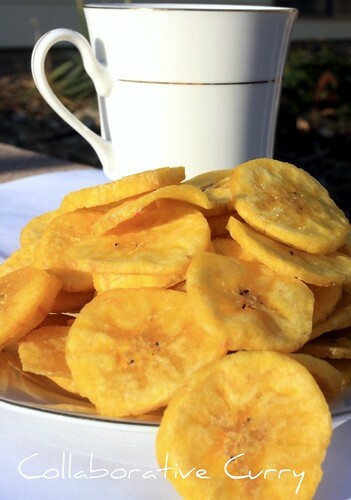 wow....banana chips and tea...perfect combination! !..lovely clicks!..looks so crispy n nice! Excellent photography..very nostalgic chips:)looks very crispy and yummy.. There was a time when I used to finish the whole pack of banana chips in one sitting..this crispy piece of goodness is bringing back old memories.. The chips look perfect... great snack actually! Wah! 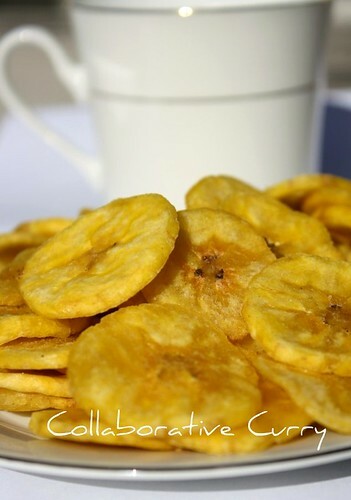 the banana chips look so inviting and crispy with beautiful pictures . look so nice and crispy!! perfeect munching!! woman, u got me missing my home in kerala now..I want to walk by the markets, buy the piping hot upperi from the street side stores..the pic is brilliant..
Ur chips look perfect, love the color. Great snack to have anytime. Chips looks really crispy and perfect..lovely!!! Crispy, Colorful & Yummy Yum! Wow.. i'm craving for that plate of chips.. yummy! I remember my malayalee friend brings these when he comes from her native, cochin.. it wil taste divine.. mmmm...! nami, these chips look so tasty! im a big fan of banana chips, so are my boys. my poor parents always end up with excess baggage while visiting us coz they have requests for kilos of these from every one! wonderful pics too! Lovely pic. Looks so fresh and crunchy. All time favourite. Looks perfect Kerala chips. I've visited Cochin twice till now and have carried loads of these. thanks to you can surely try my hand @ home on these . Thanks for dropping by my blog and in turn bringing me here. Chips have come out so well. Perfect color and crispness. oh u made this at home.i am a great fan of this.send me some .drooling over those pictures. Chips looks crispy and perfect dear, I can eat the whole packet without winking!! Love these banana chips .Your photos are lovely. beautiful pictures...these are one of my favourites from childhood..
Oh, I love banana chips! These look so yummy and inviting, great photos! mmmmm, they look crispy and perfect!!! we are great fans of nendra pazham chips too; we buy it in kilos whenever we travel (back in india)... I've always beleived that these were prepared after sun drying etc... this method is worth a try; but here, to find this nendra pazham , hummm, that's a tough task; nice recipe! !